Have you ever heard the phrase, “Fake it until you make it”? I'm sure you have. But don't do it. Instead, “Act as if and go as though”. What does that mean? Well, scroll down to the video or the transcript to find out what the distinction is and why it's so important. Keep in mind this video is from a Facebook Live so some events I talk about may be out of date. 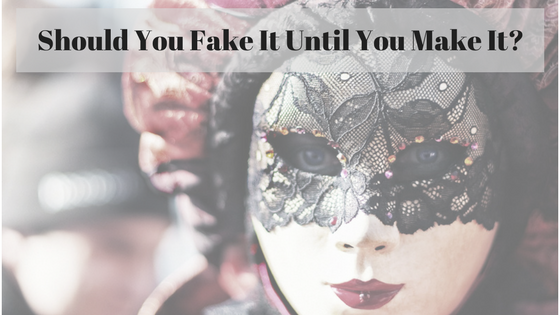 Should You Fake It Until You Make It? from Tracey Hausel on Vimeo. Hi, everybody. This is Tracey Hausel from traceyhausel.com, coming to you from my living room in Wilmington, Delaware, 20 minutes south of Philadelphia, Pennsylvania. Let me move my cursor before I accidentally shut down the livestream. All right, so today I want to talk about should you ever fake it until you make it. Well, let's look at what the words mean. Fake means it's not really you, right? No parts of you, okay? Now, when I was 17, almost 18, the summer before heading to college, University of Delaware, I was going to student orientation. I told my dad he didn't have to go because he wouldn't have gotten it anyway. I picked up my friend, Kevin, because he wanted to go to the financial aid office and up we went. Then, we went up to what then was North Campus. Now it's called Laird Campus. It's where they were holding student orientation, and he left. […] I said, “Don't leave me!” because I was terrified to be by myself. This was huge. I had to have someone go with me. No lie. I could not have gone by myself. I would have gotten there, but it would have been really ugly. He says, “Tracey, I've got stuff to do. Fake it until you make it.” Hmm. Well, what I didn't know then, what I learned years later, was that I didn't fake it. I became my future self. I became the person I could be, someone who was confident, who was sure of what they were doing, and wasn't scared of the process that all those other kids were going through. But, that wasn't what I did, [it] wasn't fake it until you make it. I thought it was at the time. What it was… what I learned from a cowboy, it was “go act as if, go as though”, which means act as if you're already where you want to be and continue acting that way and go that way. What “fake it till you make” it means is that when someone fakes it they're trying to be somebody else. They're trying to be their favorite guru or their favorite whoever, personality, celebrity, and they're not being themselves. So, you're not drawing people who are like that person. You're actually repelling them because they see that you're fake, and you're actually pushing those people away because you're not being you, and you know what else you're not doing? You're not having the people who really do need what you provide, you're not attracting them. They're never going to find you because you're not being who the person they need. I want you to think about that. Act as if, go as though versus fake it till you make it. I think I'll keep with act as if, go as though. Okay. Next week I'm going to be out of town. I'm actually going to be with Tecademics. They have a week long course going on, on e-commerce. It's full, I believe, for this year, but if that's something you're interested in, if e-commerce is, that means having a store on the internet and selling stuff, I do have other training I can recommend to you. 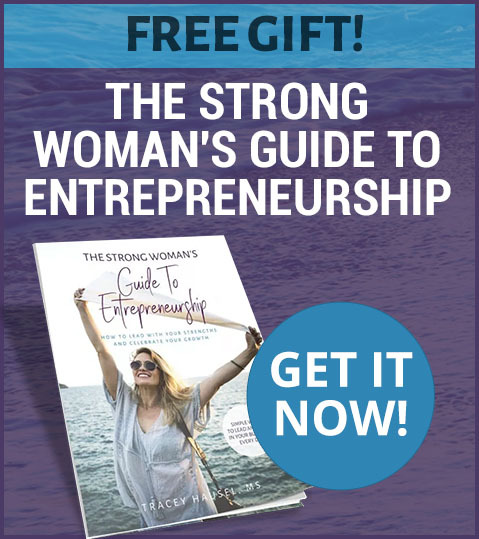 You can go to traceyhausel.com/shopify to learn about that. Also, if you missed … This should be the same way. If you missed the replay or the video of the Facebook Live clinic, I will put a link for that. I'm thinking it's the same one as I gave out the other day, traceyhausel.com/studio, but I'll double check just to make sure. All right, again, I don't know … I won't be coming on one o'clock. That part I can probably guarantee you. I'm going to see if I can come on. It depends what all's going on and I may not be teaching next week. I just might be sharing what's going on. Okay? But, I will see you guys at some point and you have [a] wonderful weekend. Have fun watching the Super Bowl. Go Falcons. I'll talk to you later. Bye-bye. Oh, don't forget. To keep seeing more videos like this don't forget to click on live notifications when the video ends. If you're on my page watching this don't forget to like my page, and to hover over the following button, and to click “See First”, and to see all of the, make sure notifications is on. Okay? Talk to you later. Now, that you understand the difference between, “Fake it until you make it” and “Act as if and go as though”, share this with people who need to hear about the difference on Facebook and Twitter. I don’t like faking it because after awhile you become a fake you! Exactly, you are becoming someone else. Thanks for stopping by. I like the parallel in your story, and stories intrigue people. Great job Tracey. Much success!